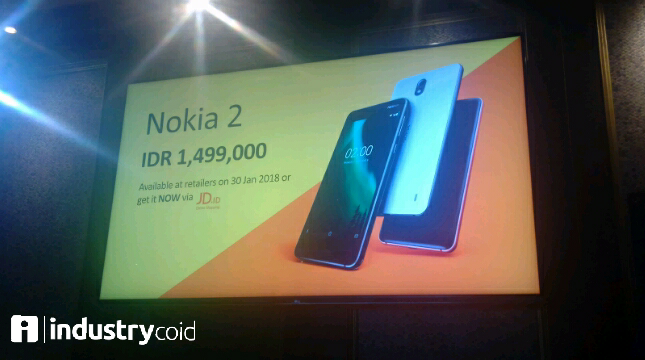 INDUSTRY.co.id - Jakarta - HMD Global, Nokia's exclusive licensee for mobile phones and tablets, announces the launch of Nokia 2. Smartphones that carry the distinctive features of Nokia in terms of battery resistance are designed to continue working, without having to frequently recharge the battery to keep it working. Comes with a battery capacity of 4100 mAh, Nokia 2 can survive for two days with just one charging. Battery life of this phone does not necessarily affect its performance. Combining Qualcomm's Snapdragon processor and a high-quality 5-inch screen with a secure Android operating system, and always up to date, Nokia 2 offers reliable technology. "We have created smartphones that people can rely on, without them having to put the battery into use in their everyday activities. Each component from Nokia 2, from screens to batteries, chipsets to design systems, has been designed to consume less power from its large batteries." Country Manager - Indonesia, Australia and New Zealand, HMD Global, Mark Trundle in Jakarta, Thursday (11/1/2018). He added, it allows users to get a durable phone that can be relied upon. "Nokia 2 is made for users to have the freedom to do more things, without having to reduce their daily activities." he said. Nokia 2 delivers unparalleled durability in design, leveraging all the hallmarks of Nokia's legacy of quality, simple and reliable. Its sleek frame is precisely made from one aluminum block, while Corning Gorilla Glass comes with polycarbonate sculptures on the back, making it not only look elegant but also sturdy, as expected by users of Nokia smartphones. Premium materials and immersive ergonomic design are combined to create unique, practical models and styles, allowing users the freedom to enjoy a durable and affordable smartphone experience. Not only 4100 mAh battery capacity, 5-inch LTPS LCD screen also offers a crisp and clear viewing experience, while lower power consumption. Nokia 2 also gives users the freedom to fully indulge in endless entertainment - from HD video and crisp and clear photos to favorite songs, social media, and web browsing - without worrying about running out of battery. With an 8MP rear camera featuring automatic scene detection and auto focus, the Nokia 2 allows users to produce fantastic images all the time. While with the stock 5MP front camera, users can capture the moment from any angle. Extra capacity will also be available for every user captured memories with a dedicated memory card slot, complete with Google Photos for unlimited photo and video uploads. Nokia Smartphones always offer a safe and always updated Pure Android experience, with amazing features like Google Assistant (without pre-installs or skins). Launched with Android Nougat and allowing upgrades to Android Oreo, Nokia 2 will receive monthly security updates to make users feel confident that their smartphones are safe and up-to-date. Available in Pewter / Black, Pewter / White and Copper / Black color options, Nokia 2 can be found at the company's authorized distributor distributor, PT. Teletama Artha Mandiri and PT. Sentra Prima Distribution starting January 30, 2018 or online through JD.ID now, at a price of Rp.1.499.000.